Laying low on the Willamette River is Portland, Oregon – the West Coast’s under-the-radar hub of craft beers, good food, and outdoor lovers. Smaller than Seattle, more relaxed than San Francisco, and just as entertaining as L.A., Portland is a diverse city nestled between mountains and the riverside. It’s no surprise that it’s one of America’s fastest-growing cities. Arlington Heights sits atop a hill overlooking the city below, and is home to some of the best vistas of all the Portland neighborhoods. From the International Rose Test Garden to the Arboretum to the walking trails that run through the neighborhood, Arlington Heights is any outdoor lover’s dream. While most homes are on the pricier side here, the fact that downtown is a short walk away instead of a long bus ride might make the cost worth your while. Not quite urban, but not quite suburban: Sellwood-Moreland, a mix of city amenities and quiet comfort, is one of the best Portland neighborhoods for families. Home to some of the best schools in Portland, public transportation so easy a kid could (and likely will) use it, and family-friendly attractions like movie theaters and even an amusement park, Sellwood-Moreland has plenty to offer parents and kids alike. Because this neighborhood is a bit more suburban, it’s less expensive than its downtown neighbors, and its excellent transportation infrastructure makes getting downtown a breeze. A former industrial area, the Pearl District is now the up-and-coming neighborhood for young Portlanders. Lively street festivals and events are frequent in this busy neighborhood, and breweries collide with impeccable food to make the Pearl District a great place for a night out. It’s also a great place to live if you like to be in the center of it all. Just don’t expect this to be a bargain neighborhood – most of the Pearl District’s real estate comes from new developments, so apartments here are rather expensive. Cheaper than the Pearl District, but with just as much action is the Northwest District, also known as Nob Hill. 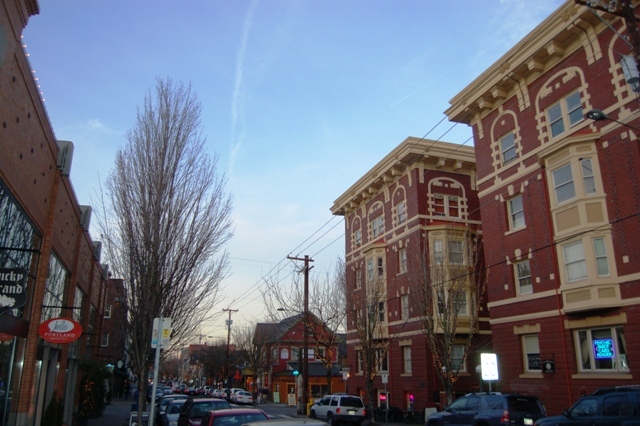 One of the city’s oldest neighborhoods, the Northwest District has a mix of new developments and older buildings that have been around since the early days of Portland, making it the perfect place to find a beautiful place at a smaller price. It’s an adventure just wandering around the Northwest District: on some streets, you’ll find quaint shops catering to baby boomers, while a few streets over, you’ll find the rowdy restaurants and trendy boutiques appealing to the millennial crowd. But think carefully about your commute from the Northwest District: if you need to cross the river to get to work, there’s only one bridge in the neighborhood, and it’s a part of jam-packed Interstate 405. 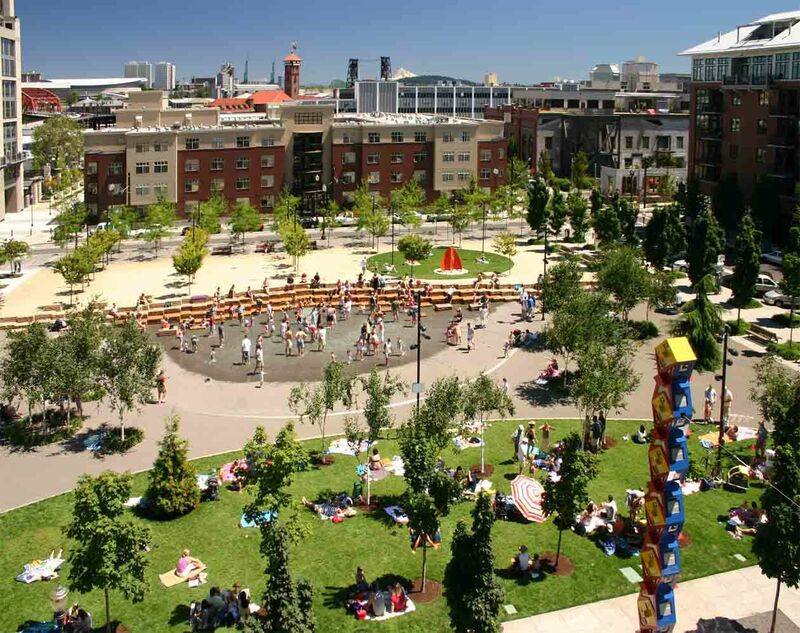 Nature lovers who still enjoy city life, rejoice: the South Waterfront in Portland was (quite literally) made for you! This former industrial site is one of the largest urban redevelopment sites in the entire country, with the vision to eventually become the city’s central district, akin to Manhattan or downtown Los Angeles. But don’t let the high rises fool you: there’s a greenway, a beautiful waterfront, and it’s built to preserve the health of the Willamette River’s salmon population. But all the luxury comes at a price: as one of the newest Portland neighborhoods, it’s also one of the most expensive neighborhoods to rent or buy real estate. Just across the river from downtown is another redevelopment project that provides a less expensive option than the South Waterfront, with a few incredible amenities. The Lloyd District, where you’ll find Portland’s convention center, stadium, and the city’s largest shopping mall, is a recently redeveloped area. It now boasts restaurants, shops, high-rise apartments, and great public transportation to downtown thanks to its vicinity to the Moda Center and Memorial Coliseum. The Lloyd District is where you can enjoy the most exciting parts of the city without paying downtown prices. You’ll find an eclectic mix of the early developments of Portland and the newer Chinatown developments in Old Town-Chinatown, home to many of Portland’s most famous landmarks. If you’re a fan of Voodoo Doughnuts, Portland’s famous Saturday Market, or the world-renowned Lan Su Chinese Garden, it’s worth living nearby to avoid trying to get there from the rest of the city. But you’ll need to remember that Old Town-Chinatown’s bridges lead into Interstate Five, making them a traffic magnet, especially when the bridges go up. And while living in the heart of it all may seem expensive, Old Town-Chinatown is a fairly economical Portland neighborhood compared to its neighbors – just be ready to run into tourists on your way to work. Step out of busy city life and step into Ladd’s Addition, Portland’s first planned neighborhood and a tranquil mix of residential homes and rose gardens. Organized quite differently than most neighborhoods, Ladd’s Addition may be confusing if you prefer traveling in a grid system. But the beautiful homes, many of which are nationally recognized historic sites, make it worth the confusion. And while it may be more expensive and less accessible than some neighborhoods, those looking for a quiet reprieve from city craziness may find Ladd’s Addition to be the Portland neighborhood of their dreams. Meet downtown Portland’s less flashy (and less expensive) neighbor. Goose Hollow is just as historic as Ladd’s Addition or Old Town-Chinatown, but has a larger mix of apartments, single family homes, and townhouses, giving buyers and renters more options and more diversity in their neighbors. As a bonus, Goose Hollow is perhaps the most centrally located Portland neighborhood without being on the waterfront, meaning no bridges and less traffic. It’s a fantastic place to find a cheaper home with many of the prime amenities of city living. No matter which Portland neighborhood you decide to call home, Dolly can help with all your move-in needs. Whether it’s moving a whole apartment’s worth of stuff in, or just bringing home an eclectic couch from Goodwill, we’ll provide you with the truck and muscle to get it done. Leave the waiting for the bridge to open to our Helpers while you get out and explore your new neighborhood.